The L&D’s Infection Control Team have a wealth of knowledge and expertise in the continued fight against Infections. The Teams focus is to prevent infection and help protect patients, visitors and staff. What can Patients and Visitors do to help prevent the spread of Infection? DO NOT VISIT if you are feeling unwell or have had diarrhoea or vomiting in the last 72 hours. It is vital that anyone who is feeling unwell with gastrointestinal symptoms, vomiting and or diarrhoea, does NOT visit the hospital as this increases the risk of spreading the infection to patients and staff. One of the most important measures to prevent the spread of infection is to perform good hygiene. Use Hand Sanitiser on entering and leaving ward areas. Wash your hands frequently, especially before eating and after going to the toilet. Norovirus, which causes diarrhoea and vomiting, is one of the most common stomach bugs in the UK. It’s also called the “winter vomiting bug” because it’s more common in winter, although you can catch it at any time of the year. Some people also have a slight fever, headaches, painful stomach cramps and aching limbs. The symptoms appear one to two days after you become infected and typically last for up to two or three days. If you experience sudden diarrhoea and vomiting, the best thing to do is to STAY AT HOME until you’re feeling better. There’s no cure for norovirus, so you have to let it run its course. Flu is a common infectious viral illness spread by coughs and sneezes. It can be very unpleasant, but you’ll usually begin to feel better within about a week. You can catch flu – short for influenza – all year round, but it’s especially common in winter, which is why it’s also known as “seasonal flu”. It’s not the same as the common cold. Flu is caused by a different group of viruses and the symptoms tend to start more suddenly, be more severe and last longer. Cold-like symptoms – such as a blocked or runny nose, sneezing, and a sore throat – can also be caused by flu, but they tend to be less severe than the other symptoms you have. Flu can make you feel so exhausted and unwell that you have to stay in bed and rest until you feel better. For most people, this will take about a week. Both infections can be passed on in many different environments where lots of people are gathered together such as schools, offices and hospitals. When an outbreak of infection occurs in hospital, it is often necessary to close affected wards to help control the outbreak and ensure that patients are treated in appropriate areas to minimise the risk of passing on the virus. Staff follow strict procedures to limit the spread of infections, this can include wearing special protective equipment. Infected wards are reviewed on a regular basis and undergo a deep clean once the viruses are no longer present in any staff or patients. 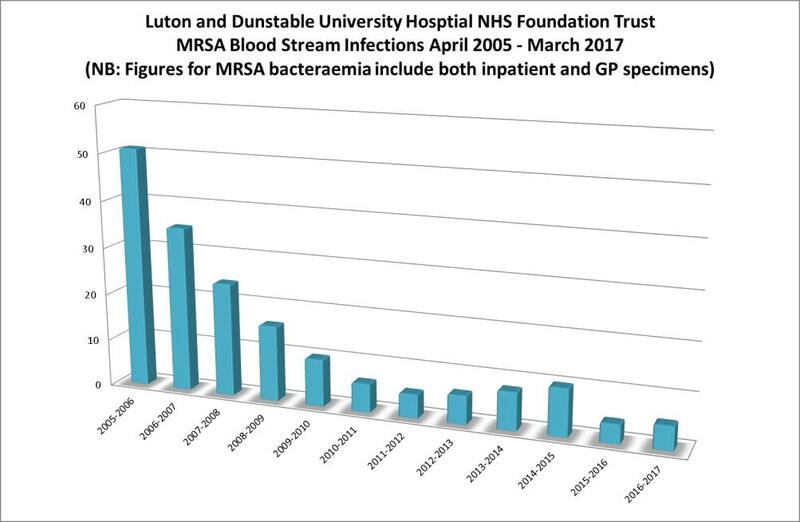 All emergency admissions and patients admitted for planned or day case procedures are screened for MRSA, except for those exempt under Department of Health guidance. MRSA are bacteria that are not affected by some common antibiotics. They can be present in the nose or skin of healthy people without causing a problem.MRSA can cause serious infection in sick patients in hospital if they get into the body through a cut and into the blood stream. It is spread by direct contact with an affected patient or by indirect contact with the bacteria in the environment. Spread can be prevented by everyone washing his or her hands properly, or hand cleaning with alcoholic gel and by keeping the hospital clean. Some patients affected by MRSA may also need to be kept apart from other patients to prevent it spreading further. MRSA infections can be treated with special antibiotics. 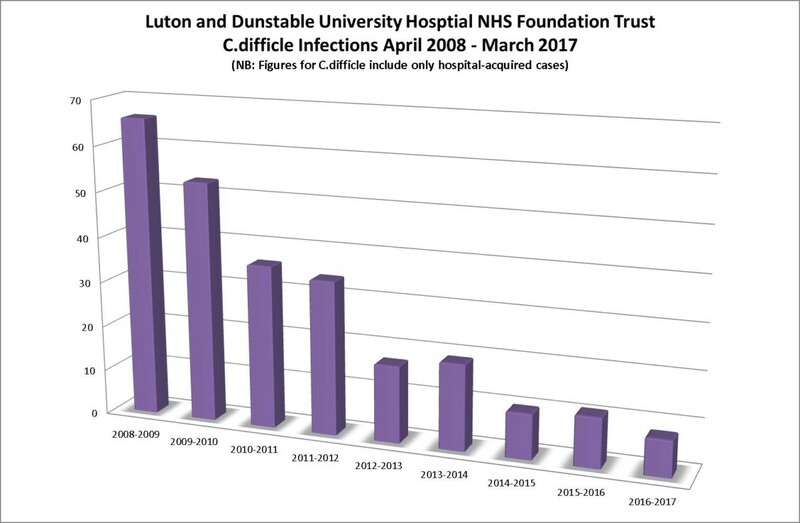 C.difficile is a bacterium that can cause severe infection in the gut. The result is watery diarrhoea and stomach cramps that are very weakening, especially in elderly and ill people.It is spread by touch with the contaminated diarrhoea, directly with an affected patient or by indirect contact with the bacteria in the environment. Spread can be prevented by washing hands after going to the toilet and before and after meals, by keeping the hospital clean and by nursing separately.